Welcome to gamify-uk and micro-rave! Our fusion of colourful characters, bespoke installations and video game theatre have been entertaining across the UK and beyond since 2009. With customised activities and retro-arcade-themed challenges, we engage audiences at YOUR event with minimal tech bringing participants and attendees INTO the action. 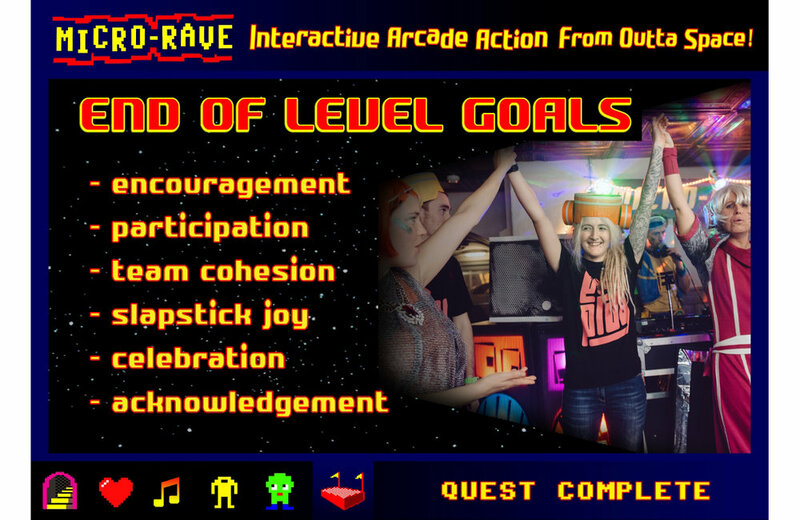 Expect intergalactic hosting skills, slapstick games, pixel props, wacky costumes, 8-bit music, arcade reenactments and fun that is uniquely immersive! “All hail the Micro Rave!! - achieving cult status before our very eyes..."
“Micro Rave... you are an essential part of our yearly event... we will always want you back." 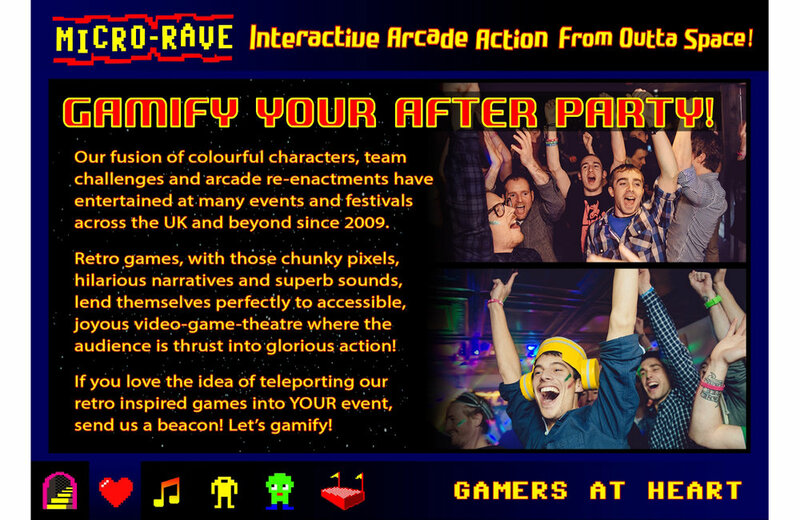 “ORACLE (Micro Rave) was on our stage at EGX last year... brilliant!!!" 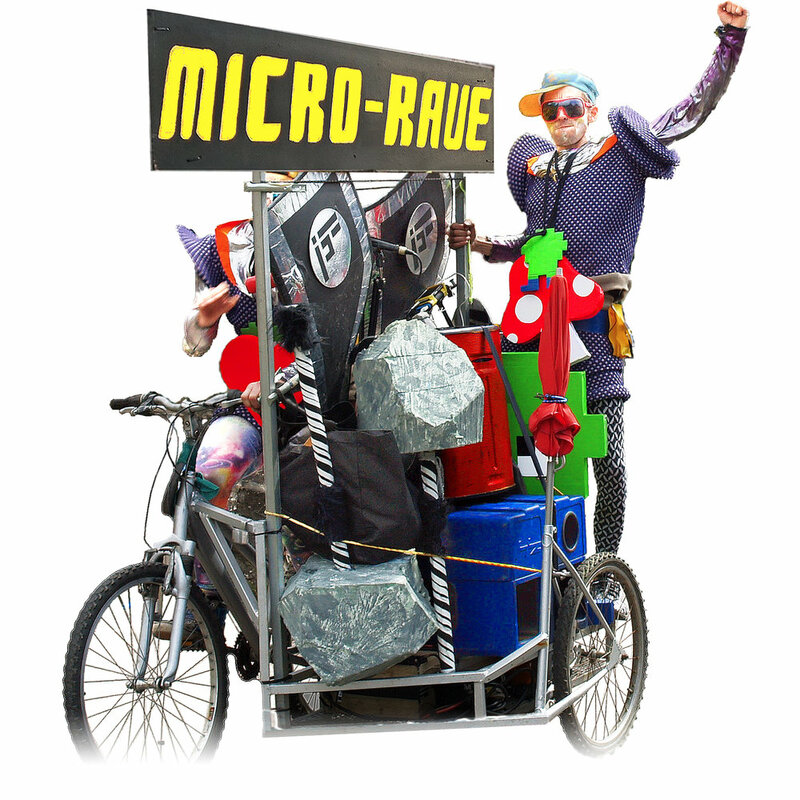 “Micro Rave are very flexible and resourceful with a brief. Collaborating was a joy and they sure know how to enthuse a crowd!" Our roster of experienced performers are passionate about gaming, physical play and immersive theatre. We care about the players experience and enjoy nothing more than encouraging and glorifying participation. Our dedication to Instant arcade action gaming and nurturing Rave Action Role Playing is evident in the services we provide. Immersing an audience in the re-enactment of a video game world of the imagination is helped along with graphics! It simply wouldn't be the same without the bright coloured pixel sprites we know and love from the retro arcades. So we make our own using recycled materials! If there is a SCRAPSTORE near you, check it out because this kind of recycling is a way forward for responsible re-use of planet earths resources!!! At the heart of any Micro Rave is a love of music... specifically the triumphant 8-bit fanfare. 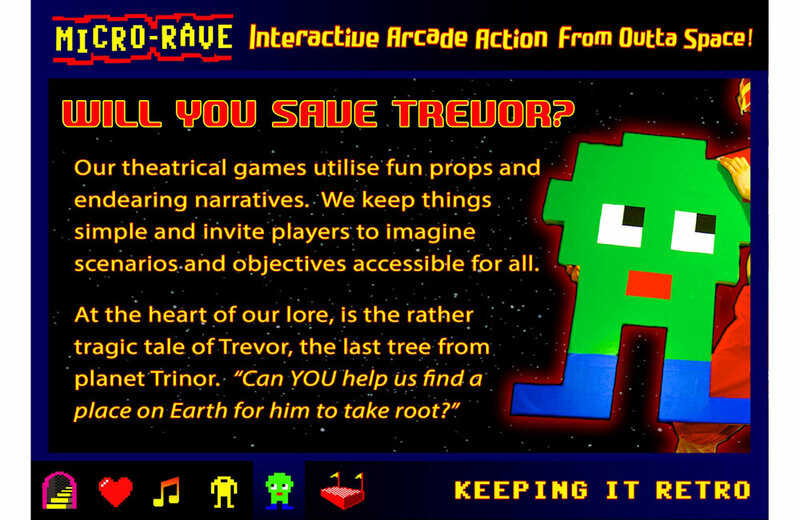 Whether its classic theme tunes from the good old arcades or the era of beautifully orchestrated unsung microcomputer masterpieces, we guarantee there will be music and fx to accompany your journey, be it the frantic action of a rescue mission or indeed the glory of being awarded a medal! Sign up with your email address to receive event news, promotions and updates. You can unsubscribe at any time and your details will never be shared with other parties. Thank you and welcome to our Newsletter group! We shall inform you of any upcoming Micro-Rave events and promotions in due course!